Classical music is not dying–if you believe Fred Child, that is. 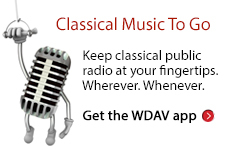 Fred, who hosts American Public Media’s “Performance Today,” gave a talk Monday entitled “The Death of the Death of Classical Music,” part of WDAV’s 30th Anniversary Celebration this week. He listed many successful orchestras, stunning classical CD sales figures, and the like, all the while encouraging his audience that classical music was very much alive. Now this is a risky proposition, but I say we could use a few modifications in concert audience protocol for the sake of keeping classical music alive. First thing to go would be those awkward silences between movements. Yes, yes, sometimes those quiet moments are appropriate, but haven’t you ever felt desperate to clap at the end of an exciting movement? And isn’t it terrible when that thrilling music is met with deafening silence, at least until someone in the back coughs or there’s a smattering of creaking music stands? Perhaps an outlandish suggestion such as this will touch on a nerve (and feel free to comment! ), but it’s one change concert audiences can afford to make. Bernstein’s Mambo was meant to break silence in half–not to be received by it. Let’s apply that rule to other music, too.